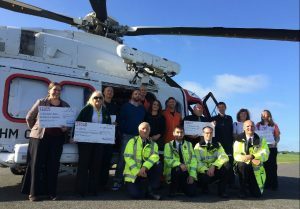 An unusual backdrop of a Coastguard helicopter was chosen for a major cheque presentation which took place on Wednesday 28 September 2016 at Bembridge Airport, Isle of Wight. 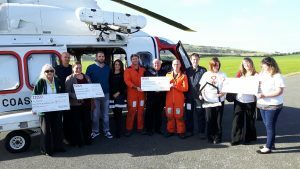 The magnificent sum of £35,000 was raised by Tesco and the tireless efforts of Leanda and Neil Riley, the parents of Betsy Rose Riley who lost her fight for life at Southampton General Hospital in March this year. Born 15 weeks prematurely and suffering from a rare condition, Betsy Rose lived for just 52 heartbreaking days. During this time Leanda and Neil Riley from the Isle of Wight were able to have free ‘home away from home’ accommodation nearby at Ronald McDonald House Southampton. Betsy Road Riley cheque presentation for the four charities benefitting from a summer of fundraising by the Riley family, particularly a Betsy Rose Ramble and in-store fundraising in July by Tesco staff, are Southampton Hospital Charity, The Hampshire and Isle of Wight Air Ambulance, the Coastguard Association and Ronald McDonald House Charities. 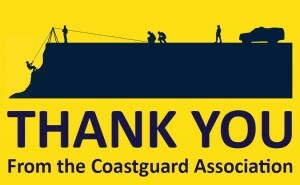 The total raised was divided between the 4 charities and CGA Chairman Stuart Arundel and members from Ventnor Coastguards were on hand to receive a cheque on behalf of the Association and to express thanks for the fantastic efforts of everyone involved. Previous Previous post: Year 4 students raise £500 delivering a Sea Safety Day!